The social norm of eating chocolate before midday—okay, 9am—is rolling around again, where our healthy eating habits fall off the radar and Brisbane succumbs to Easter’s sugary grip. Now, we’re not encouraging this type of behaviour, but if you did happen to fall off the salad wagon, we’ve got a perfect hit-list of desserts, sweet treats and decadent specials from across Brisbane to keep you well and truly covered for the long weekend. Bring your appetite, things are about to get… indulgent. An all-time, classic Stokehouse’s famous Easter Bombe is back again. 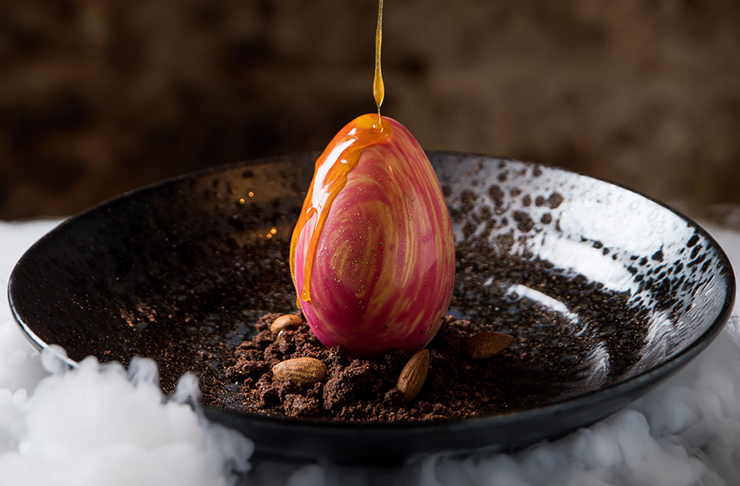 Featuring a milk chocolate parfait (made from Easter eggs) and mandarin sorbet and covered in toasted meringue and fresh raspberries, this is one classy dessert. 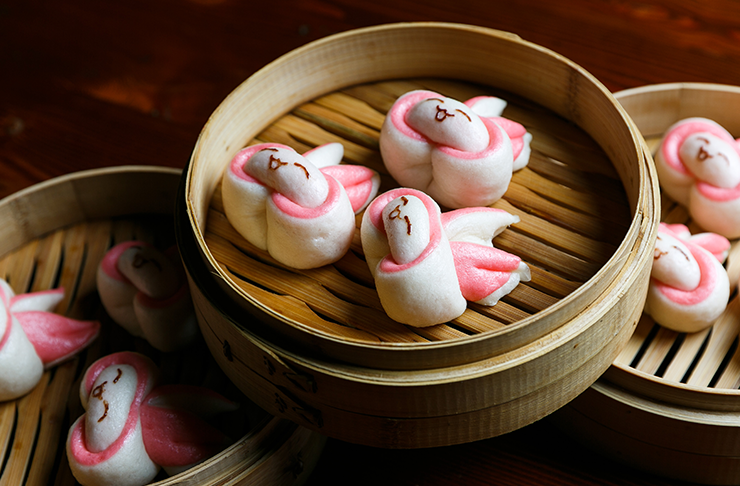 Releasing an exclusive dim sum menu over the Easter period, Little Valley are showing off some serious skills with their intricate pumpkin puffs. One of only two savoury entries on the list (we like to keep you on your toes) these delicate morsels of mushroom, beef and black pepper encased in a crunchy orange dumpling shell. 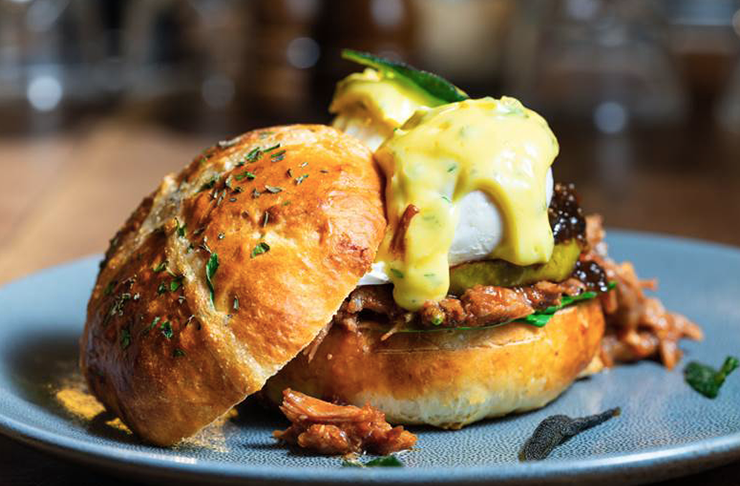 Filled with sticky BBQ pork, poached eggs, caramalised apple and drizzled in an apple cider hollandaise, Chapter IV’s sage and onion hot cross bun is worth the calorie intake this Easter. 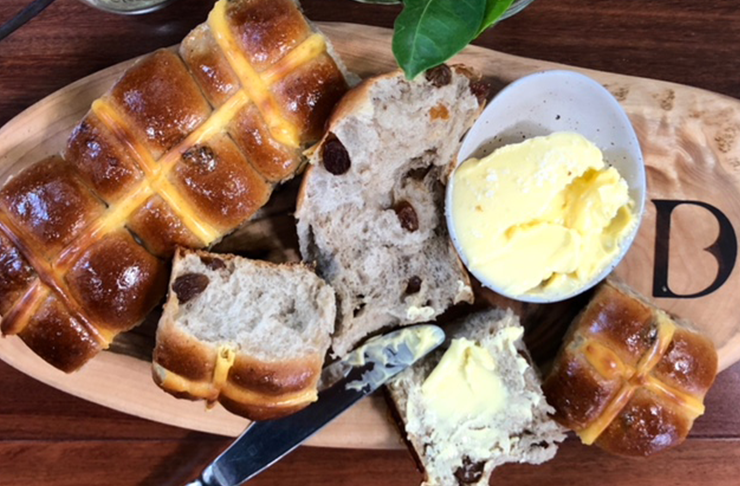 Three Blue Ducks' pastries are iconic around these parts, so it makes sense that you'd make pilgrimage to W Hotel to savour their limited-edition hot cross buns. Baked in-house on the daily, dive in to these pillowy, fruity delights until the end of April. 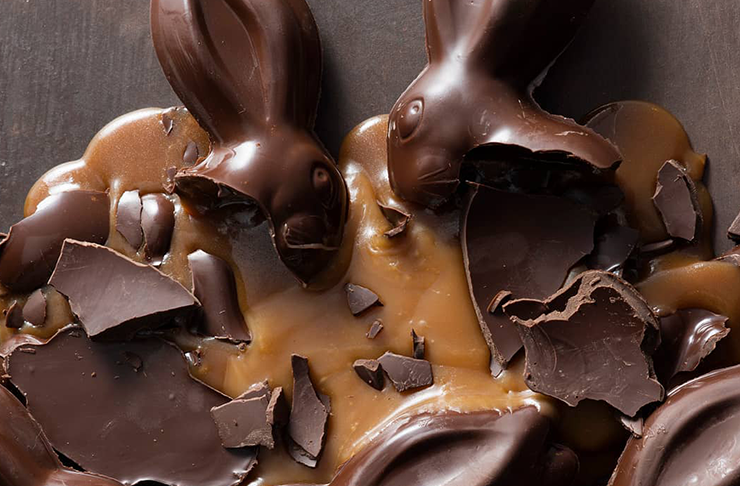 Brisbane chocolatier-slash-dessert icon New Farm Confectionery have brought back their sell-out salted caramel-filled chocolate bunnies. Order yours asap—these beauties go fast. If there’s one dish that gets people talking (and booking dinner reservations en mass) it’s Saké’s exclusive Dragon Egg. Back this year from the 15-25 April, you’ve got just ten days to get your hands on this elusive dish before it disappears again. Basil & Vine are legendary around town for their indulgent cake shakes. 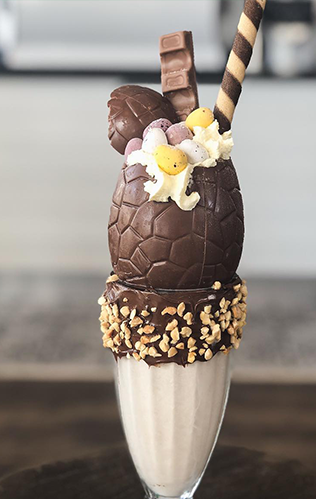 Literally blending cake slices into their thick shakes, this Easter they’re adding in chocolate Easter eggs to up the ante. Chocolate not your thing? 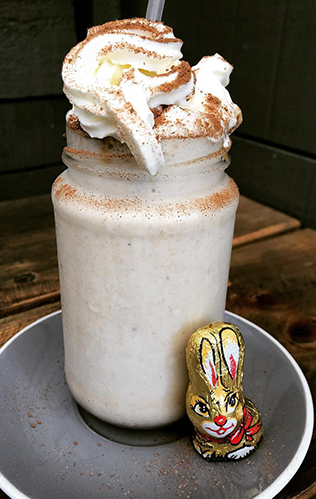 Little Loco know how to please the masses, serving up a decedent carrot cake thick shake that also comes with a side of Easter chocolate in bunny form. Trust us, you’ll be hooked. Feel like bringing Easter to you? Hit up San Churro on Menulog this Easter and add their Bunuelos Snack Pack to your basket. 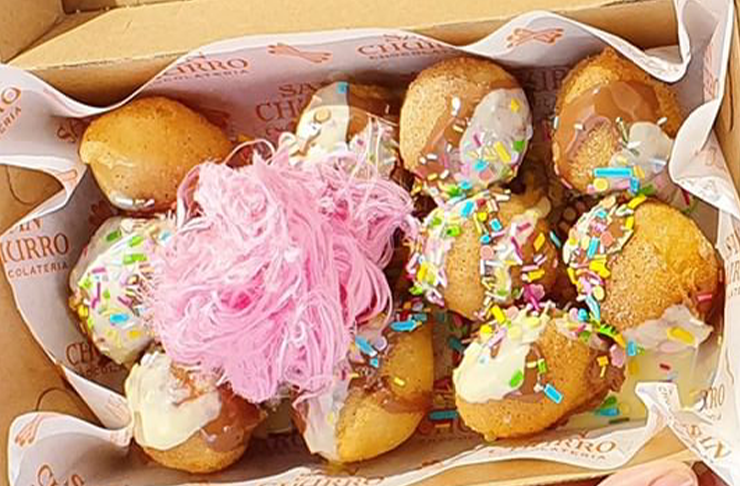 Freshly made Spanish doughnut balls are rolled in cinnamon sugar, drizzled in chocolate and topped with strawberry floss and funfetti. Stretch the legs this Easter long weekend with these 7 perfect day trips around Brisbane.